Lots of apps, websites, and services use Facebook logins to connect you, but when you agree to log in using those apps, you’re usually also handing over permission to access your private info. Apps can see a ton of information about you, such as who you’re friends with, your favorite Facebook groups, and more. Facebook app permissions never expire, so if you agreed to them years ago, they could still see your data until you remove them. First, log into your Facebook account via the web. Then, go to your Settings menu and click Apps on the left of the screen. 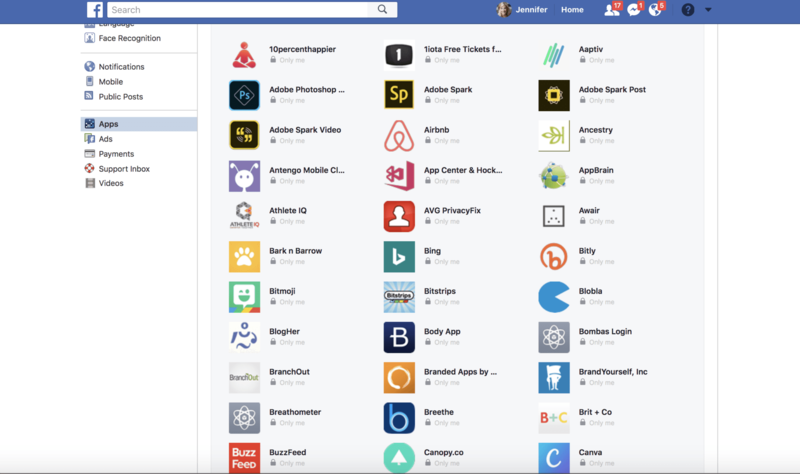 From here, click the little arrow that says “Show All” to browse all the apps you’ve connected to Facebook. Brace yourself, because there’s probably a lot of them. When I opened up mine, I was blown away. Over the years I’ve logged into a ton of different sites and apps using Facebook and, according to this list, there were 298 different apps with access to my data! Removing their permissions is a cinch, but if you have as many as I do it’ll still take some time. All you have to do is click the little “X” that shows up next to the app when you hover over it with your mouse cursor. Once you click it, it’s gone forever, unless of course, you choose to add it again later. As you’re going through the list, you’ll likely notice some apps that you regularly use, like Spotify, Photoshop, or other popular ones. I choose to keep those active just because those are apps that I trust with my information, but these are decisions you’ll have to make for yourself. Chances are you’ll also see lots of apps you don’t even remember using or haven’t used in years, and you should give those the big “X” treatment! For apps you choose to keep, you can click the little “Edit” icon next to the “X” to check what information each app is allowed to see. Depending on the app, you can change whether it sees your friends list and if it can send you a notification or not. This is useful if you want to keep an app but don’t want it to see your contacts. Following this guide is your first line of defense against your information being spread to people who shouldn’t have it, so spend some time to keep your digital identity safe and sound.